Sometimes I have trouble sleeping. So, when I moved last fall, I decided to start fresh with my new bedroom, and eliminate any possible sleep disruptions. I hung blackout shades, installed a while noise maker, and bought some new pillows. I even got rid of my alarm clock, because it shed extra light in the room, and hey, that’s what cell phone alarms are for, right? I had an alarm clock that played cd’s, and after growing to hate every single song I tried to wake up to, I had converted back to the simple beep beep. It seemed silly to keep the whole clock around just because it had the potential to play music that I never used. I still get a jolt when I hear Otis Redding’s Dock of the Bay come on the loudspeaker in public after waking up to it for so many years. Now I wake up to the aptly named “Alarm” alert of my iPhone, and while I have had a few snafus when I accidentally turned the ringer off, overall it has been a much more pleasant way to wake up, without the glow of the time shining annoyingly in my face if I wake up at 2am can’t fall back to sleep or ruining any more of my favorite songs. But now, I have another problem to contend with. In the same way my CD alarm made me hate every song that shook me awake in the morning, my iPhone has trained me to hate the sound of any tone I use as an alarm. Because so many people have iPhones with the same set of sounds, and so many people like me have give up on old fashioned alarm clocks, there’s a new first-world-problem in town. It’s called phone alarm stress disorder (PASD), and it refers to the intense annoyance, and stress you feel whenever you hear someone using your alarm tone as their ring tone. 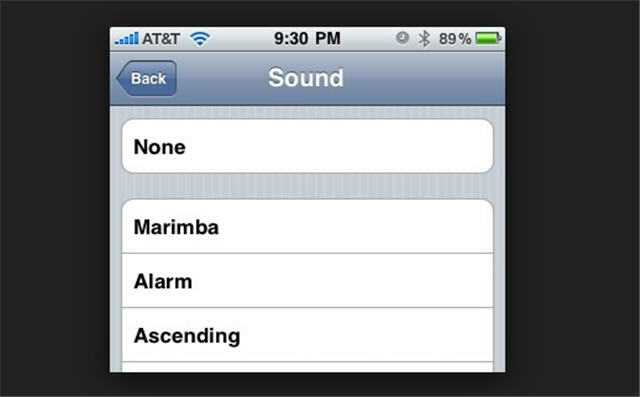 With only just under 30 choices for every sound your phone makes, and millions of people using the iPhone as their cell, mp3 player, and mini-computer, you are bound to encounter someone who has decides that Alarm is a good sound to notify them when they receive a text, or a phone call from the parents. The sound that jolts you from sleep in the morning, popping up unexpectedly throughout your day can be extremely offensive, and cause you to tense up, much like how you feel when your alarm hauls you out of that lovely dream you were having in the morning. It’s unavoidable. So, if you own an iPhone, do us all a favor. ONLY use the alarm tone for your alarm (duh, that’s why they conveniently named it that). And, if you want to be a less annoying person in general, stay away from any of the really grating tones in general –bark, duck, and old car horn, I am looking at you. Your friends, and acquaintances will thank you.